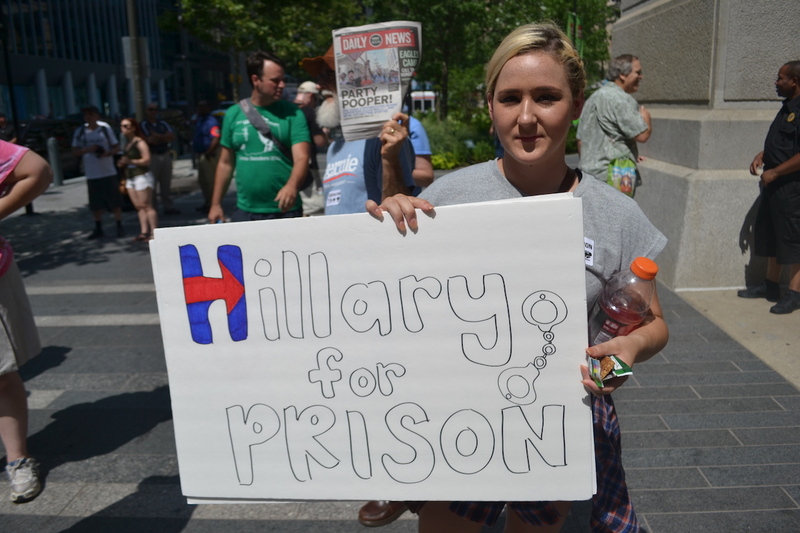 PHILADELPHIA –– Five minutes after arriving in the city, we see our first Hillary for Prison sign. Along with Build the wall and Lock her up, Hillary for Prison was the most popular chant at last week’s Republican Convention. And here it is again, being used by Bernie Sanders activists to protest Hillary Clinton. Conventions are meant to be a public show of party unity, a week of tub-thumping for the nominee. 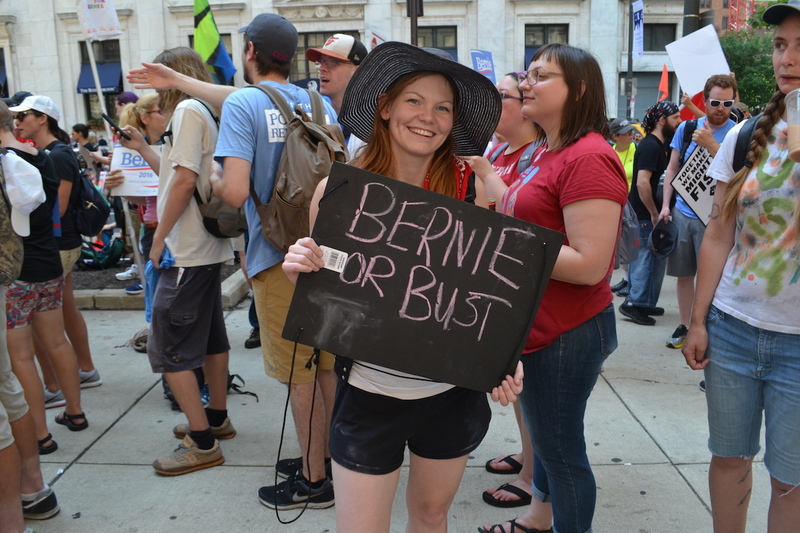 But tens of thousands of Bernie fans have traveled for days to reach Philadelphia to voice their loathing of Hillary, with a vitriol to match what we saw at Cleveland. In fact, many of Bernie’s supporters dislike her with such a pathological hatred that they have pledged their votes for Donald Trump, just to spite her. 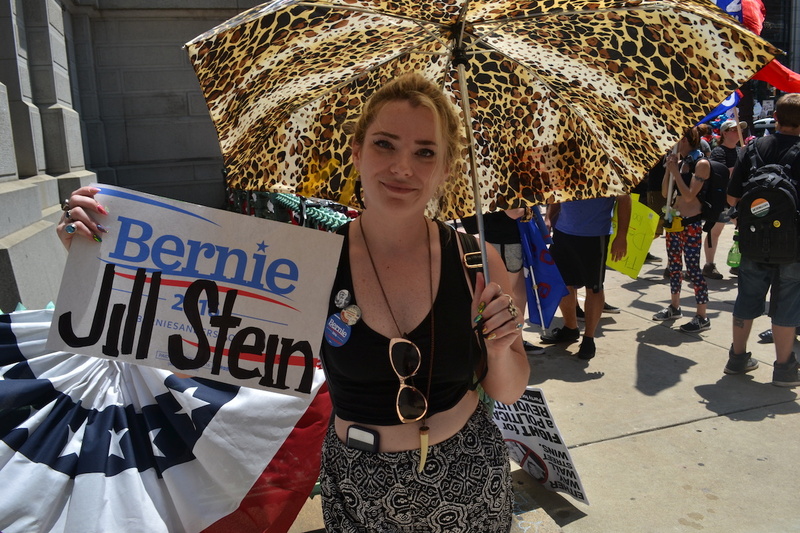 “I don’t have any faith in Trump, but I don’t hate him like I hate Hillary,” she explains at a pro-Bernie rally near City Hall. This year’s Republican Convention was unexpectedly quiet (authorities anticipated 1000 arrests a day; 24 was the final figure). 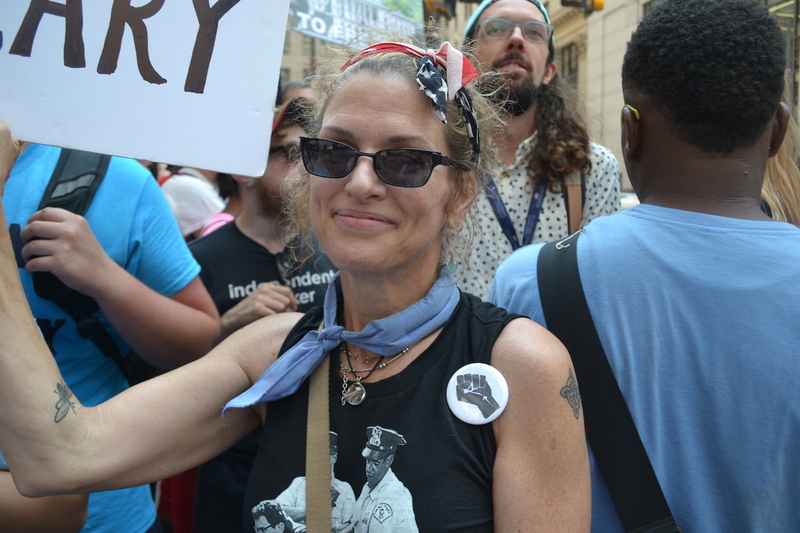 There were hardly any vocal protests of Trump, and very few made the trip to Cleveland. 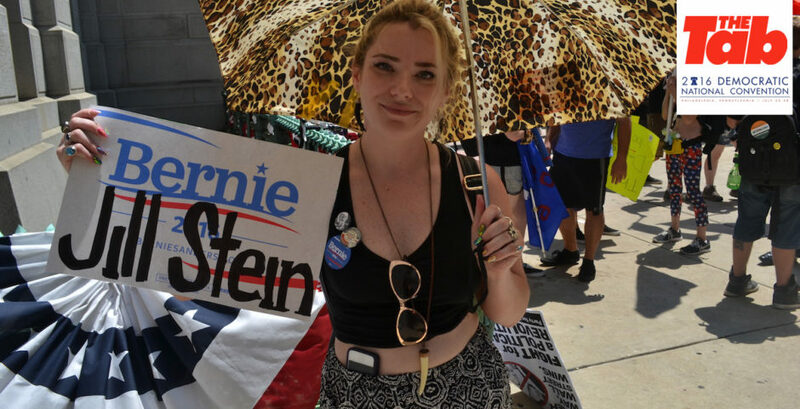 But here there are anti-Hillary demonstrators from across the States – Texans, Ohioans, Californians who journeyed for Bernie, even though he lost the primaries weeks ago. Dixie, from Tennessee, tells me she would be happier to see Donald Trump become President than Hillary. But what specifically about Hillary makes her worse than Trump? What policies? “Hillary is… fracking. You know, there are a lot of issues that she appears to tell to people, because she, she… flips on the issues. She’s right of center. I want a progressive candidate who is far left of center. Hillary is in this for Hillary, Bernie is in this for the American people. Trump and Hillary are in it together, I’ve said that since the beginning. You have to question that.” Right. 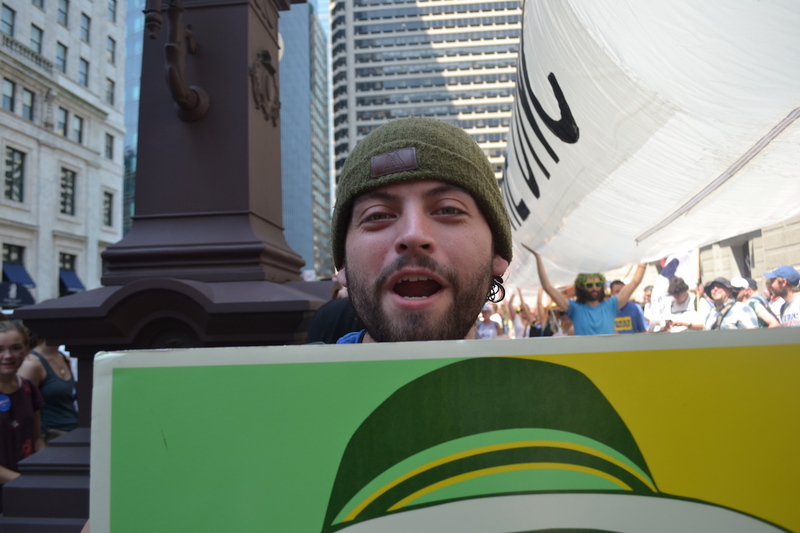 We’re interrupted by a group of political activist stoners parading past carrying an enormous blow-up joint. A bearded demonstrator holds up the front end of the joint with eyes tinged a deep red, like a hippie Atlas. His mouth hangs open in a wide grin. “We smoke pot and we like it a lot,” shouts an aged activist into the loudspeaker. The beaded man joins in, not quite in time with the rest of the crowd. The conspiracy theories never stop. The stoners, who took a minute to rest in the blistering sun, pick up their huge inflatable joint and move on.